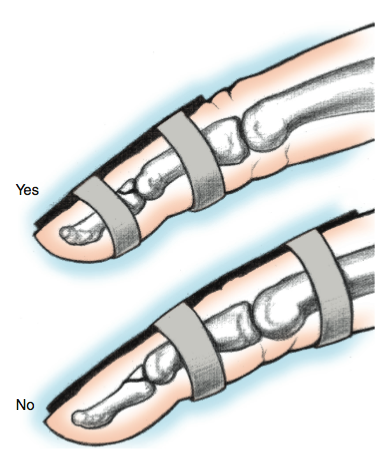 Mallet Finger Injuries Handout | Dr. Thomas Trumble, M.D. What are Mallet Finger Injuries? These are common injuries that occur at the tip of the finger when a sudden blow such as having a finger struck by a ball during sports cause the tip of the finger to suddenly flex, which ruptures the extensor tendon, allowing the fingertip to fully straighten out. These can occur with or without a fracture. Swelling in the distal interphalangeal (DIP) joint that is the joint closest to the nail bed occurs sometimes with some slight redness and there is a pronounced droop to the fingertips so that one can use the other hand to straighten the fingertip out, though the minute it is let go, the finger droops back to a position that has been referred to as a mallet finger. This is so called Mallet Finger because it resembles the hammer or mallet of the piano keys with a special bend that is in the instrument at the tip to strike the piano chords. Who has Mallet Finger Injuries? These can occur in any age group. Although they are rare in growing children because the growth plates usually cause a different pattern of fractures. They are very common in sports injuries, particularly when the ball strikes the finger rather than the ball being caught by the hand. How do we diagnose Mallet Finger? Clinical examination confirms the inability to extend the fingertip. X-rays are helpful to rule out fractures that can occur in approximately 20% of mallet injuries (Figure 1). How do we treat Mallet Injuries? If the fracture fragment is less than 50% of the joint and that reduces well with the finger in extension, simple splinting is sufficient. The splint should only cross the DIP joint and not the next joint, the PIP joint (Figure 2). It is important for the DIP joint to be maintained completely extended so that the tendon does not heal in a lengthened position that will allow for recurrent drooping of the digit. When there are large fractures and the joint cannot be fully reduced, the surgery is necessary to pin the joint into a reduced position. This can also involve screw fixation in extremely large fracture fragments (Figure 3). The surgery is done as an outpatient often with a general anesthetic, though a regional block can be used. The patient is to wear a splint after surgery for approximately 10 days to help the tendons to heal without being inflamed or irritated. A general course of therapy for two to three weeks is generally recommended once the sutures are removed 10 days after surgery. In general, the patient can return to most, activities in three to four weeks after the surgery. Typically local anesthetic is injected in the area of surgery to help provide pain relief. This can also provide some numbness in the region of the thumb, this is expected and is normal. The extensor tendon that has been ruptured is extremely slow to heal. This requires eight weeks of nonstop splinting or the use of pin fixation. Even at eight weeks, we recommend using the splint during the daytime for an additional week or two. Therapies are often helpful to help adjust the splints as the swelling decreases and to provide modifications that make it easier for work and activities of daily living. When pins are used, they can be removed in the office in most cases two months following the surgery. The goal is to allow gradual increase in finger motion. The uninjured flexor tendons that cause flexion of the digits are much stronger and more powerful than the extensor tendon. In general, excellent range of motion and strength is regained although there can be some residual swelling and stiffness for three months.